Happy LoL Days George! What a lovely post. I always enjoy visiting, and especially love your photos :) Can't wait to read your story! :) Love the Halloween pics btw. Hi Roz, thanks for stopping by. I am a bit nervous about submitting my story, but then I figured, just go for it! A lovely post and blog. I'm not sure if I've every stopped by before. Welcome Ronnie, I am so glad you stopped by and said hello. I enjoy your blog, but I think I am guilty of only lurking! Perhaps I will have to change that bad habit! Just love it, George! I so love all your photographs and you're not the only one who blames ageing on forgetfulness! Snigger! Hi Ami my friend, thanks for dropping by. I don't really consider either one of us old, but it is a great excuse! Happy LOL Day George...love coming to visit and seeing your awesome photos. Thanks for sharing. Hi there..first time here...love that I will soon be reading a story over at PK's.. Thanks for stopping by. Kind of intimidating submitting a spanking story with all the great writers out there. I added your blog to my following list and I look forward to getting to know you better. Happy LOL Day George! I always love visiting your blog - you are such a warm and friendly guy - and your photos are always a treat. Hope you get to enjoy meeting lots of new friends today! Cali, hello. Thank you for such a nice compliment. It is really hard to be cranky around all the nice folks like you and your hubby! Glad you enjoy the pictures, I am very blessed that I get to see all the places IRL. I will being praying for your safe travel. 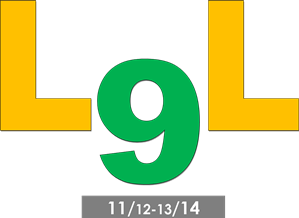 Thanks for joining us for LoL 9. Isn't it interesting that you and I are the same age. Hello Hermione, I wouldn't miss this day! Interesting we are the same age. I am an Aquarius, how about you? Wait a minute, wasn't asking your zodiac sign a pick-up line back in our day? LOL Oops! Happy LOL day to you my friend. Hi George! :) Happy LOL Day to you and Nina! I always enjoy stopping by and reading here. Thank you for sharing. Hello Katie, so glad you came by. Thanks for the compliment. I do enjoy traveling and wish I could take everyone body along, but alas I cannot, so the photos are the best I can do. BTW, I love your moniker with the moon! A black cat crossed my path and he made me happy for 17 years. I started out blogging because of PK and sent her my very first story and she published it and guess what - the dam broke. I look forward to reading your story. Leigh, welcome. Thanks for coming by today. PK is a great lady and I am comforted in knowing she will be the final judge if the story is OK and decide to publish or not...either way is OK with me. I'm so glad that your dam broke. It was holding back a lot of water!! 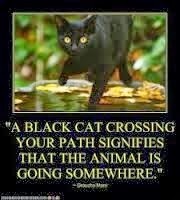 I am intrigued about the black cat...sometimes things happen in most unexpected ways and sounds like that was a fortuitous moment! Hi George! I am so happy you are going to send PK a story! I have done that as well! It is nerve racking but OH SO MUCH FUN!! I can't wait to read the story!! Hi Minelle. It is a bit scary, but now that I told the world (well at least our little part of it) that I was going to do it, I will have to get busy and get it done! I apologize for being tardy...it is hard to visit everyone in such a short amount of time...I hope you have a wonderful week-end and I will look forward to reading your Fantasy Friday story...I have written a couple a while back and is a lot of fun and everyone is so kind and supportive... Take care! Hi Terps, glad you found me and thanks for stopping by. I hope my story will be to everyone's liking. It is my first attempt at writing and I have sure have had a lot of fun with it. I find it very cathartic do you? Hi George, Happy (belated) LOL Day! And thank you for visiting my blog. It is a little confusing to read how you write about Nina, :), but I am not her, I am the other one (oh my, what this sounds like again ...). But I am sure we are easy to distinguish, because where your Nina would say 'prepare for a spanking', I'd rather say 'I am ready for my spanking, Sir'. I got your mail a few minutes ago, thank you for the journal-idea, and yes, we are actually doing this, I have started with it while my bump was still growing and keep adding to it. I can only recommend doing so, just reading what has happened this year is great. Great Halloween pictures, love them both! Thanks for dropping by. Yes I do know what you mean about my Nina and then seeing you here and there. But you are right as rain about that big difference between y'all with you saying I am ready for my spanking and my Nina saying get ready for a spanking! But isn't it great how we all can do our own version of what works for us and yet everyone is made to feel right at home. Glad you are doing the journal, you won't be disappointed I promise. 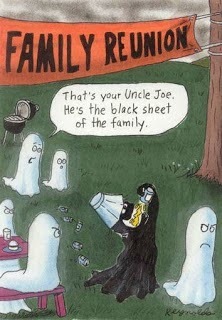 Cute Halloween pictures I agree and I especially liked the "black sheet" of the family. Hey George! I'm so glad you finally sent the story and I'm really looking forward to having it as part of Fantasy Friday - it'll be up the first weekend in December! PK, thank you for dropping by, but mostly thank you for putting up a first timer's story on your Fantasy Friday!